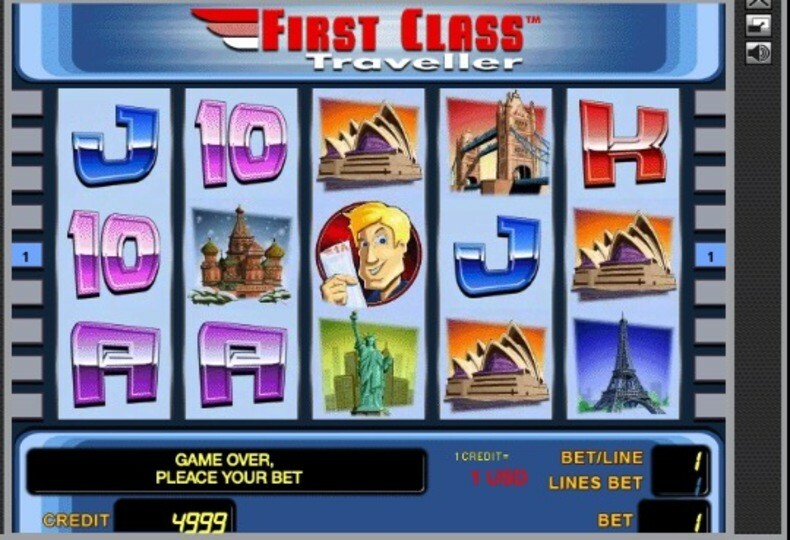 This cheeky little game, First Class Traveller slots, is pure classic Novomatic in every way possible. As soon as the game loads and you here the sounds, you know this is made by Novomatic (often called Gaminator or Novoline in Europe). Targeted at a more adventurous type of players, Novomatic’s First Class Traveler is a 5 reels video slot with 9 paylines, which can be adjusted both manually or through a Max Bet button. By employing symbols such as the Eiffel Tower, Tower Bridge, Kremlin Cathedral, The Statue of Liberty and Sydney Opera house, First Class Traveler slot takes us to the most popular tourist spots across the world and provides a generous spinning potential of 25 bonus rounds. The Airplane Scatter symbol will trigger the extra spins when it lands on any of the reels in the combination of 3, 4 and 5, while any combination with the Traveler Wild will increase the won amount by x2, x4, x8 or even x16. The same icon will also act as a “Joker” or a substitute for all other symbols in forming the winning combinations - with the exception of the Scatter symbol. And, if you would like to add some edge to your gameplay, you can always opt for a gamble feature instead of simply collecting the winnings. With the max bet of 900 credits on all lines, the maximum payout a player can hit is 1,000,000 credits for a 5 Traveler icons combo. If you do not recognise the game, then that's probably because you live in a location where these slots have not appeared yet. That might be the USA or Canada. The nearest I have seen to this game in Las Vegas would be Airplane. The big similarity, to be fair, is only the airplane theme and the cartoon graphics, but it is the nearest there is right now. The nearest to this game in Las Vegas would be Airplane. The big similarity, to be fair, is only the airplane theme and the cartoon graphics, but it is the nearest there is right now. If you are an Australian or a New Zealand resident, First Class Traveler pokie will not be off limits and you will be welcome to spin the reels of this slot from Down Under. The same goes for UK based players who are looking for a lucrative fruit machine with a smooth gameplay and a medium to high return to player rate.